On May 4, 2015, the political advocacy NGO Breaking the Silence (BtS) published a booklet of testimonies concerning the Summer 2014 Gaza conflict. (As of the morning of May 4, it is only available in Hebrew.) It stands to reason that this publication is meant to support the UN’s “Schabas” investigation and bolster attempts to bring charges against Israeli officials at the International Criminal Court (ICC). As with many other BtS publications, this report lacks all credibility and objectivity. Likewise, the extensive foreign funding that Breaking the Silence receives, as well as its international political activities, highlight the problems with this publication. Despite the NGO’s claim that its mission is to address Israeli society, BtS lobbying, media campaigns, and frequent appearances in Europe and the United States target international audiences. Next month (June 4-14), BtS activists will appear in Switzerland to present their political agenda at an event organized by supporters of pro-BDS groups. Click for more on Breaking the Silence. Contrary to BtS’ claim that “the contents and opinions in this booklet do not express the position of the funders,” NGO Monitor research reveals that a number of funders made their grants conditional on the NGO obtaining a minimum number of negative “testimonies.” This contradicts BtS’ declarations and thus turns it into an organization that represents its foreign donors’ interest, severely damaging the NGO’s reliability and its ability to analyze complicated combat situations. See here for original source. Oxfam: the company [BtS] signed an agreement with Oxfam, a British organization, to conduct interviews with “as many” soldiers as possible who will testify regarding [Israeli] “immoral actions” that violate human rights. 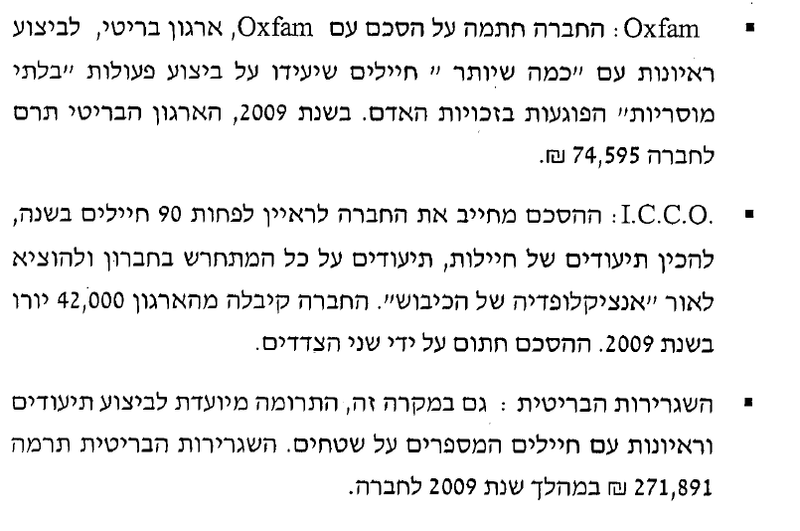 In 2009, the British organization donated 74,595 NIS to the organization. ICCO: the agreement obligates the company to interview at least 90 soldiers a year, to prepare testimonies of female soldiers, document everything that is happening in Hebron and publish an “encyclopedia of the occupation”. The company received 42, 000 euros from the organization in 2009. The agreement is signed by both parties. British Embassy: In this case as well, the donation is aimed at documenting and interviewing soldiers talking about the territories. The British embassy donated 271,891 NIS to the company in 2009. BtS’s donors in 2013-2014 include the European Union, Misereor (Germany), Broederlijk Delen (Belgium), Norway, AECID (Spain), Dan Church Aid (Denmark), ICCO (Netherlands), CCFD (France), Human Rights and International Humanitarian Law Secretariat (joint funding from Sweden, Switzerland, Denmark and the Netherlands), Sigrid Rausing Trust (UK), SIVMO (Netherlands), Rockefeller Brothers Fund, Open Society Institute, and New Israel Fund. BtS makes sweeping accusations based on anecdotal, anonymous and unverifiable testimonies of low level soldiers. These “testimonies” lack context, ignoring the fact that during the 2014 Gaza War heavy fighting took place between Israel and terror groups in Gaza, and that soldiers faced grave danger throughout the conflict from rockets, mortar shells, and terrorists emerging from tunnels dug beneath private homes. These distortions and erasures dovetail BtS’ ideological agenda and fuel delegitimization campaigns against Israel. A careful reading of the testimonies reveals that IDF soldiers conducted themselves according to the norms expected of soldiers (Israeli or from other democratic countries) when faced with the challenges of high-intensity fighting. The testimonies (if indeed reliable) that portray questionable incidents should be fully investigated. In such instances, the testimony and relevant individuals should be referred to the Military Advocate General Corps, which can order an investigation to be opened. That BtS did not approach the MAG Corps raises serious questions regarding the NGO’s motives. BtS’ allegations that the IDF operated according to a principle of “minimum risk to our forces, even at the cost of harming innocent civilians” together with “an attempt to terrorize the Palestinians” and that “serious questions arise as to the moral norms that guide IDF operations” do not tally with the testimonies, and are nothing more than an attempt by the NGO to portray the events in line with its political agenda. In many cases, the testimonies and the headlines create an impression that soldiers wanted to commit crimes. For instance, a testimony titled “I really really wanted to shoot her in the knees” actually describes how terrorist groups used civilians and animals to attack IDF troops. Another testimony mentions that the IDF attacked Wafa Hospital, but neglects to mention the terrorists operating from within the hospital. Gerald Steinberg claims that the funders of Breaking the Silence are clearly interested in portraying the actions of IDF soldiers as criminal and callous, thereby hoping to pave the way for prosecutions targeting Israel at the International Criminal Court.